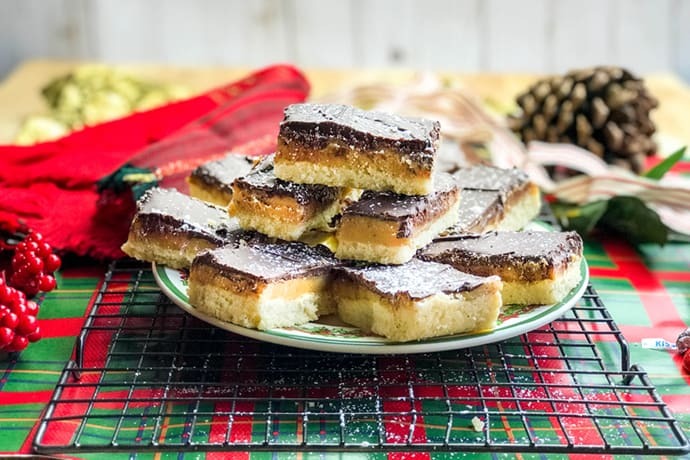 Scottish Millionaire Shortbread is a new addition to my holiday baking. 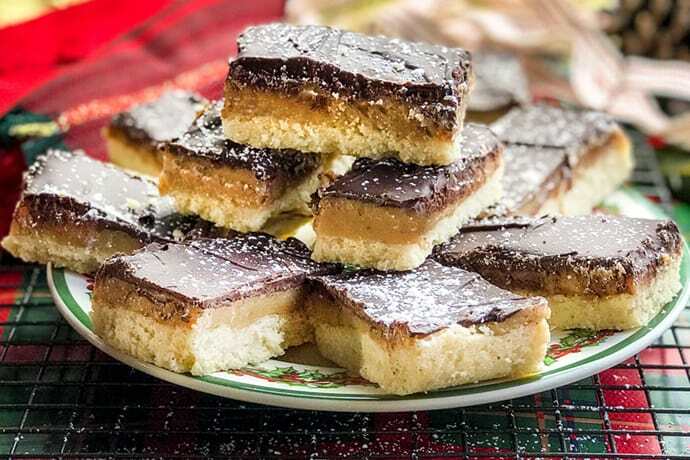 It’s a triple-decker combo of buttery shortbread, sweet caramel, and decadent chocolate. It’s already a favorite! Although there are three layers, this cookie is incredibly easy to make and so decadently delicious, you’ll instantly know why they’re so popular in Europe. 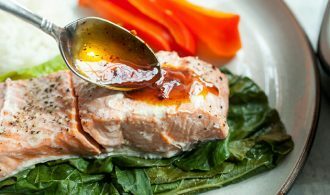 This recipe has Scottish origins. And here’s why. I agreed with her regarding the Victoria Spongecake. But my interest was pricked by Millionaire Shortbread. 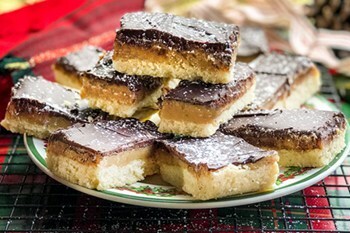 While I make boxes and tins full of shortbread every year, I’d never had Millionaire Shortbread. And after a, “Can you make these for Christmas?” I was on a quest to find and make the best European style possible. So Julia, hope these bring back wonderful memories! And by the way, these cookies make fabulous holiday gifts and freeze incredibly well. 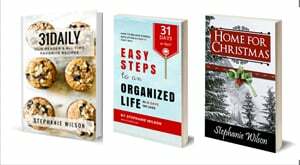 I know — my guys found them in the freezer and I’ve had to remake them several times. 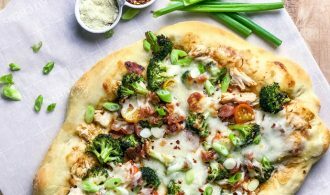 Preheat the oven to 350 degrees F and line a 13×9-inch baking pan with foil. Set aside. 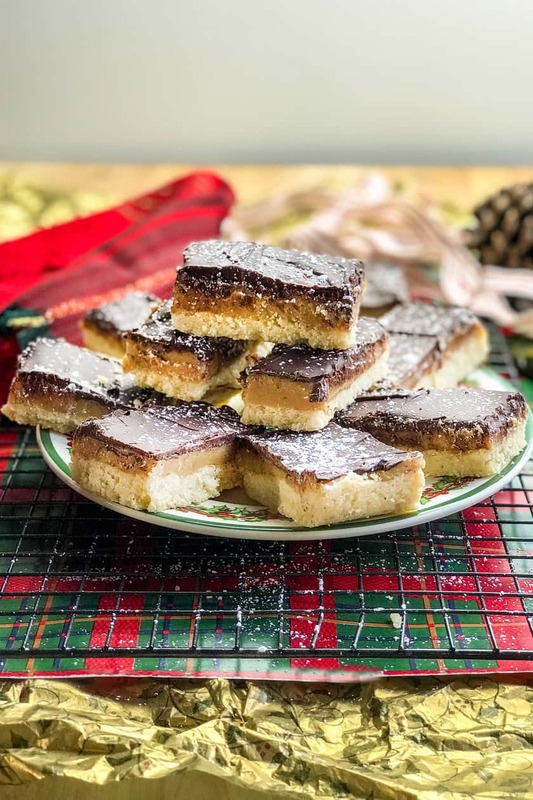 To make the shortbread: Mix the melted and softened butter together with the flour, granulated sugar, and salt until it forms a dough. Press the dough into the prepared, foil-lined baking sheet. Prick the unbaked shortbread with the tines of a fork, about an inch apart. 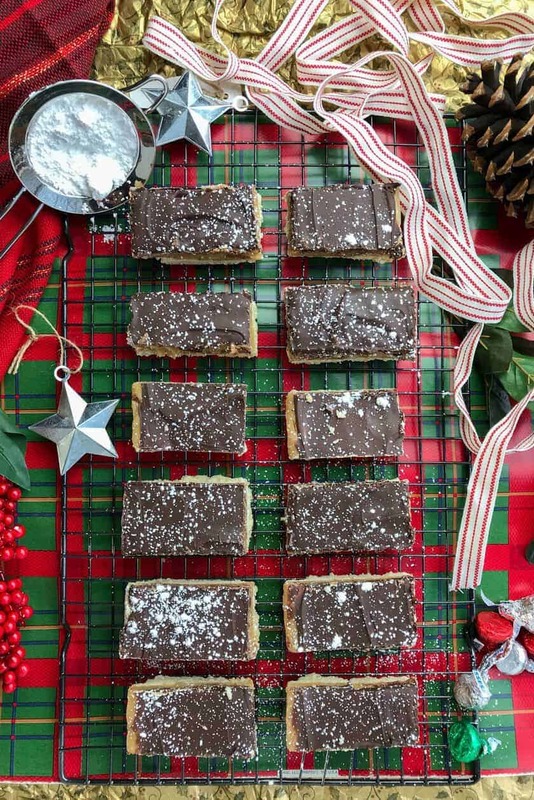 Bake the shortbread layer for 20 minutes or until it feels dry to the touch and is very lightly browned. Set aside to cool completely. To make the caramel filling: Into a medium size saucepan add the sweetened condensed milk, brown sugar, and butter; bring to a boil, stirring constantly so that the sugar will dissolve. Reduce the heat to a simmer, stir continuously for 5 to 10 minutes or until the caramel has thickened slightly. Pour over the shortbread; cool completely. I like to place it in the refrigerator to quicken the process. For the chocolate topping: Once the caramel is cool and set, melt the chocolate in a double broiler or bain marie over barely simmering water. Once the chocolate becomes shiny, remove from the heat and stir until completely melted. Pour the chocolate over the cold caramel and leave to cool. 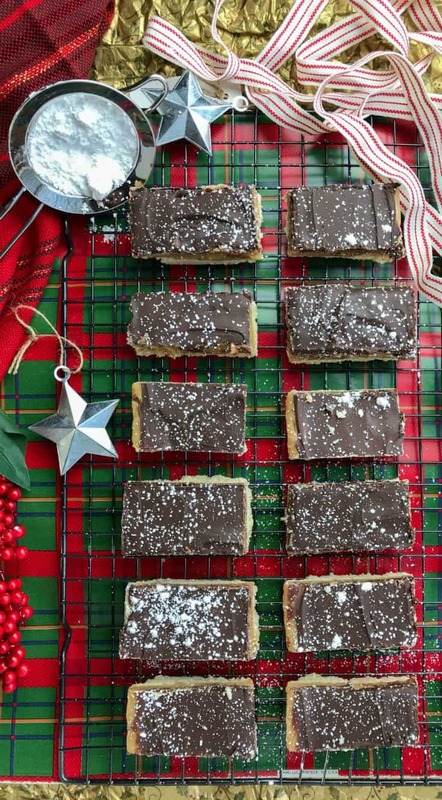 Remove the foil and cut into squares or bars and dust with confectioners’ sugar if desired. For easy removal, I like to line the baking pan with foil with an overhang on all sides. For easy cutting, use a serrated knife and score the chocolate. Then using a sawing motion, cut into the squares or bars.